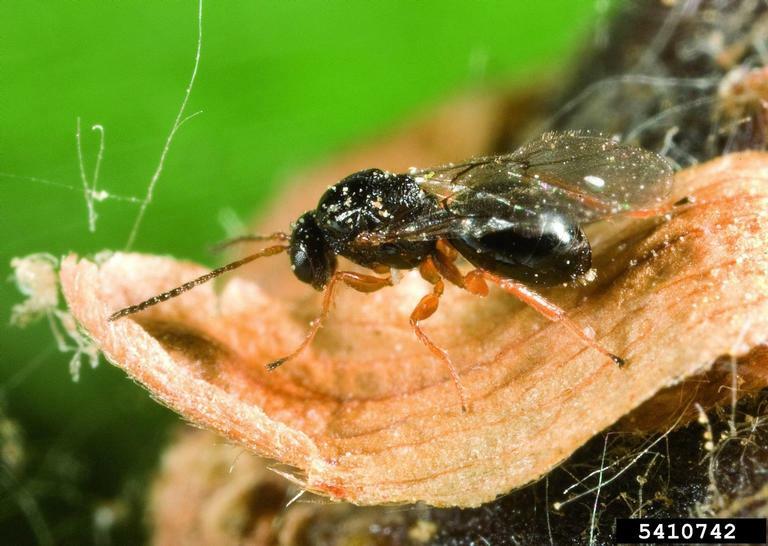 Dryocosmus kuriphilus (Hymenoptera: Cynipidae) is a species of gall wasp known by the common names chestnut gall wasp, Oriental chestnut gall wasp, and Asian chestnut gall wasp. It is native to China and it is known in many other parts of the world, particularly the Northern Hemisphere, as an introduced species and an invasive horticultural pest. It attacks many species of chestnut (genus Castanea), including most cultivated varieties. It is considered the world's worst pest of chestnuts. In the ESENIAS region, the species has been reported from Croatia, Italy and Slovenia (Bosio et al. 2010, Quacchia et al. 2013, EPPO 2011, 2014, CABI/EPPO 2015). 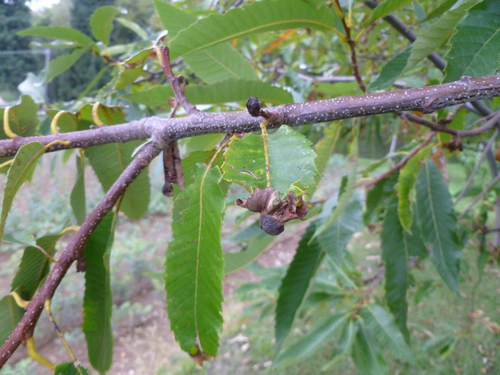 In 2016, the chestnut gall wasp was reported for the first time from Bosnia and Herzegovina (Delalic 2016) and Greece (Michaelakis et al. 2016, EPPO 2016). In Greece, the species was found in 2014. 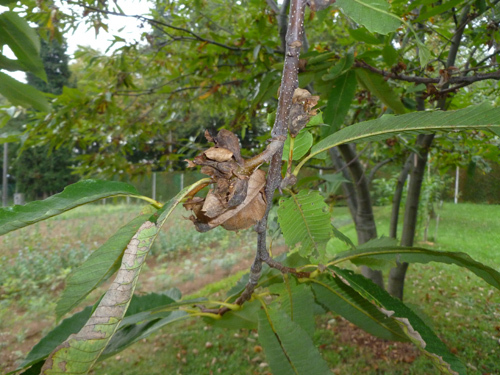 Galls were observed in a chestnut (Castanea sativa) orchard in the area of Milia (regional unit of Pieria, Central Macedonia region). For the moment, the occurrence of D. kuriphilus in Greece is restricted and measures are being developed to limit its further spread, but despite of that a natural spreading to the Chestnut forests of Bulgaria and FYR Macedonia could be expected. The species is included in the Alert list of alien species to Bulgaria. CABI/EPPO 2015. Dryocosmus kuriphilus. [Distribution map]. Distribution Maps of Plant Pests, No.December. Wallingford, UK: CABI, Map 677 (2nd revision). Delalic Z. 2016. 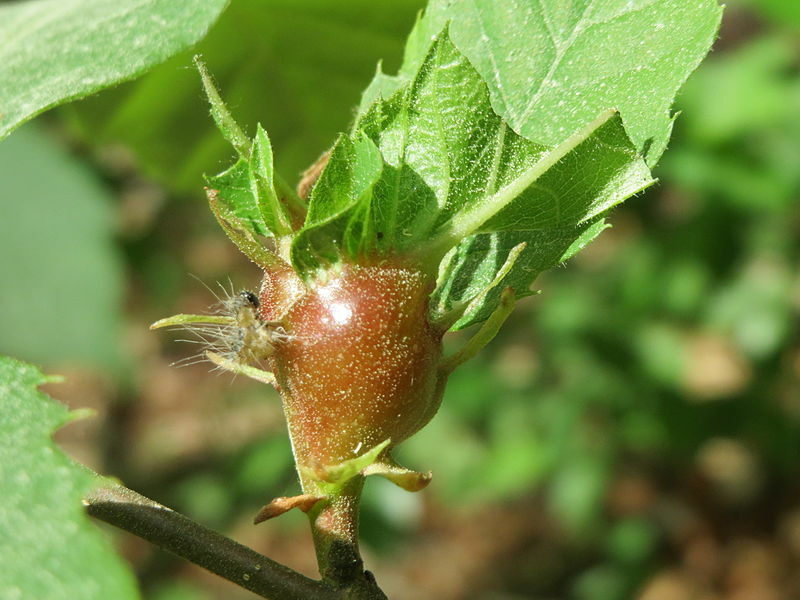 First record of quarantine pest, oriental chestnut gall wasp (Dryocosmus kuriphilus) in Bosnia and Herzegovina. Biljni Lekar (Plant Doctor), 44(1): 58-65. EPPO 2011. EPPO Reporting Service. EPPO Reporting Service. Paris, France. EPPO 2014. PQR database. Paris, France: European and Mediterranean Plant Protection Organization. EPPO 16. EPPO Reporting Service 2016/145 - First report of Dryocosmus kuriphilus in Greece. Michaelakis A., D. Papachristos, D. A. Chytas, P. D. Antonopoulou, P. G. Milonas, D. N. Avtzis 2016. First record of Dryocosmus kuriphilus in Greece. Bulletin OEPP/EPPO Bulletin 46(2): 290-294. Quacchia A., C. Ferracini, J. A. Nicholls, E. Piazza, M. A. Saladini, F. Tota, G. Melika, A. Alma 2013. Chalcid parasitoid community associated with the invading pest Dryocosmus kuriphilus in north-western Italy. Insect Conservation and Diversity, 6(2): 114-123.